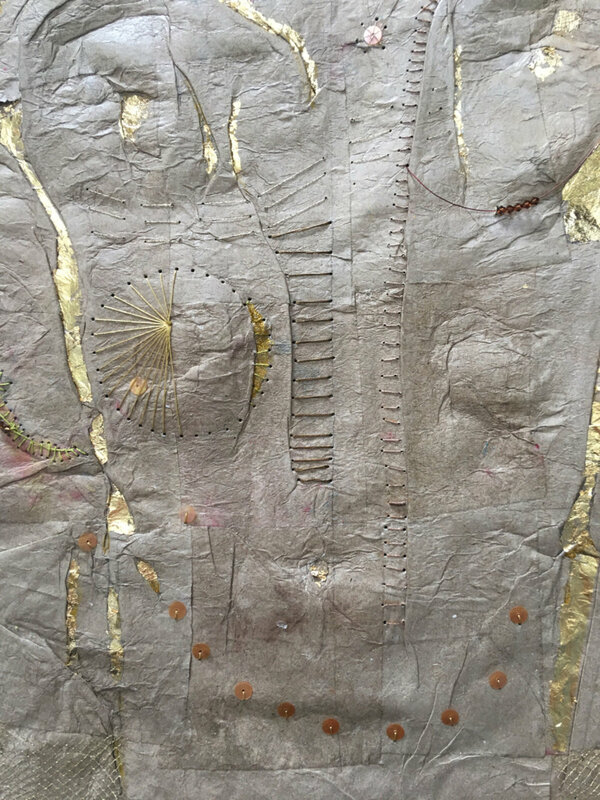 Mixed Medium—paper, silk and linen thread, gold and copper leaf. “Vestal Virgin Vest” (one in a series) is a collapsed, stitched and gold-leafed embossed sculpture. It began as a plaster body cast made over a woman’s torso. Next, I built a paper sculpture inside the imprint of the body cast. Then the sculpture was pressed flat in a printing press and, finally, embossed and stitched. The process of building and flattening the sculptures represents the collapsing of time; the threads and metal embossing represent shared stories, shared physicality, constrained privilege and silence. Throughout my career I have been following the theme of virginity—beginning in Greek mythology up to the stories of present day—and how the concept of virginity has or hasn’t changed. The Vestal Virgins have been particularly interesting. The six women’s purity and intactness was believed to secure the political stability of the city and the blessings of the gods. They represented Rome and its values, fears, and faith as well as its patriarchal systems. The Vestals were also members of a group women who “broke the glass ceiling" by having moved from private to public personalities, and were identifiable by their bodies. Christine Palamidessi is a full-time artist in Boston. Using the mediums of sculpture and printmaking she re-consecrates and re-mythologizes the body and ancient stories. Last year she was Visiting Artist at both Mass MoCA and at The American Academy in Rome. She is the author of two novels, The Virgin Knows and The Fiddle Case, and editor of American Women, Italian Style. She is the ﬁction editor of the academic journal, Italian Americana. For 13 years, she taught writing at Boston University before resuming her career as a visual artist.